Promoted: High-res Bluesound bundles at Sevenoaks | What Hi-Fi? Why settle for shoddy streams? Or confine your music to a tiny hard-drive in a low-res format? It’s time to do your ears a favour. Sevenoaks is offering a variety of ways for you to dip your toe into the high-quality waters with these Bluesound bundles. Some are self-contained, with just the amp-toting Powernode and a pair of high-quality stereo speakers, while others integrate with your existing set-up. If you have a collection of high-resolution files, you can connect the hard-drive on which they’re stored and you’re up and running immediately. Or you can simply connect the system to the internet and get streaming from services including Spotify, Deezer, TuneIn and the high-quality Tidal. You don’t have to hard-wire the system into your network if you don’t want to (handy if your router is in another room – but we recommend cabling up if you’re going to be listening to high-res material), and you can control the lot from your smartphone, tablet, Mac or PC. 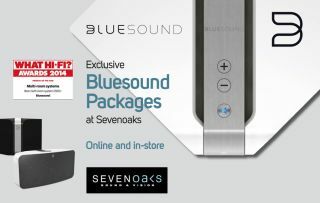 You can find out more about Bluesound here, and see the Sevenoaks bundles below or by clicking here.